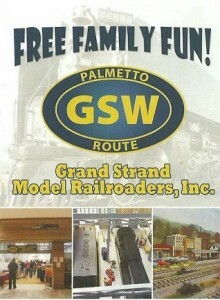 The Grand Strand Model Railroaders, Inc. exists to further the hobby of model railroading. The club was founded in 1986 above Ed’s Hobby Shop in downtown Myrtle Beach, SC with six members. The club is now celebrating 30+ years. We have grown to 60+ members who form a diverse group that share their knowledge with each other and visitors. Come visit us at our location in the Myrtle Beach Mall (Store #08) right next to Bass Pro Shops. We are a charitable, non-profit organization in South Carolina. If you or your organization would like to make a monetary donation to our club, it would be greatly appreciated. The GSMRR Club is open to the public every Monday and Wednesday 12PM to 4PM and every Saturday 10AM to 5PM. Come see trains running on our five layouts: G, HO, N, Z, and O (Lionel) Scales. Membership Information: If you have any interest in joining the GSMRR, information about the Club’s operations, activities, and membership is available on our FAQs page.